KIEV, Ukraine -- Take the smell of an army barracks, add a bit of char and gasoline, and you’d have a rough idea of the air on the fifth floor of the House of Trade Unions, the headquarters of the revolution in Ukraine. When protesters first occupied the building in December, their leaders divvied up its floors among the political parties and activists involved in the revolt. Since then, the only floor off-limits to journalists has been the fifth, which houses the militant arm of the revolution, Pravy Sektor (Right Sector), the coalition of right-wing radicals that grew out of the uprising. They had good reason to avoid publicity. After their violent clashes with police last month, their members could face years in prison if the ruling government survives the revolt. 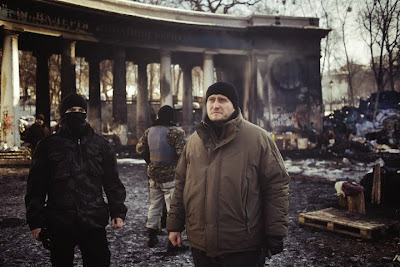 But on Sunday night, their leader Dmitro Yarosh agreed to give his first interview to a foreign media outlet. It was not so much an act of vanity as a political coming-out. He has clearly grown tired of being the movement’s anonymous enforcer. In recent days, as a negotiated end to the crisis has started coming into view, the need for a military wing of the revolution has diminished. And so has the trust in its upper ranks. Increasingly marginalized, the group has grown much more assertive and, in some ways, has started going rogue. He declined to say exactly how many guns they have. “It is enough,” he says, “to defend all of Ukraine from the internal occupiers” — by which he means the ruling government — and to carry on the revolution if negotiations with that government break down. But so far, those negotiations have been making significant strides toward resolving the crisis. On Tuesday, the parliament began debating a sweeping reform of the constitution, while allies of President Viktor Yanukovych suggested for the first time that he is ready to consider early elections. Both moves would mark a major breakthrough. But Yarosh, watching from the sidelines, has begun to doubt whether the negotiators have the interests of his men at heart. Dozens of his men, he says, remain behind bars after their street battles against police two weeks ago. With that in mind, Yarosh and another militant faction began a parallel set of negotiations over the weekend. On Monday, they claimed to be in direct talks with Ukraine’s police forces to secure the release of jailed protesters, including members of Pravy Sektor. Mainstream opposition leaders said they had not authorized any such talks. At the same time, Yarosh has demanded a seat at the negotiating table with the President. Once again, he was flatly denied. His ideology, it seems, is just too toxic to let him in the room. But neither can Klitschko and his fellow politicians easily sever their ties with Pravy Sektor. The group serves some of the uprising’s most essential functions. Its fighters control the barricades around the protest camp in the center of Ukraine’s capital, and when riot police have tried to tear it down, they have been on the front lines beating them back with clubs, rocks, Molotov cocktails and even a few catapults, in the mold of siege engines of the Middle Ages. Around the country, its fighters have helped seize government headquarters in more than a dozen cities. “Pravy Sektor has proved its loyalty to the ideals of freedom,” Yarosh says. In any kind of fair election, that would be nearly impossible. Pravy Sektor’s ideology borders on fascism, and it enjoys support only from Ukraine’s most hard-line nationalists, a group too small to secure them a place in parliament. But taking part in the democratic process is not part of Yarosh’s strategy. “We are not politicians,” he says in his office, a pack of Lucky Strikes and a walkie-talkie on the table in front of him, while a sentry in a black ski mask and bulletproof vest stands by the door. Through all his years in the nationalist movement, Yarosh, a 42-year-old father of three, says he has never had any form of occupation apart from his activism. The son of two factory workers, he was born and raised in a provincial town in eastern Ukraine, and became involved in the nationalist underground in the late 1980s, just as the Soviet Union was disintegrating. Nearly all of the satellite states of the USSR, from the Baltics to Central Asia, were then pushing to break away from Moscow’s control, and in 1988, Yarosh joined one of the more radical groups fighting for an independent Ukraine. The following autumn, months after the Soviet Union pulled its troops out of Afghanistan, Yarosh was drafted into the Red Army, a common form of punishment for political activists at the time. He was stationed briefly in Belarus before being transferred to Siberia, where he served as a guard at strategic missile sites. The Soviet doctrines of unity between Russia and Ukraine did little to soften his views. “If anything, the army made me more convinced that my path is correct,” he says. When Ukraine declared independence from the Soviet Union in 1991, Yarosh went on hunger strike to demand a transfer to the newly established Ukrainian army. His commanding officers ignored him. In 1994, a few years after he was discharged and returned to Ukraine, he joined a right-wing organization called Trizub (Trident), and slowly climbed its ranks before assuming leadership in 2005. Along with several other far-right groups, Trizub formed the core of Pravy Sektor when the current uprising broke out in Ukraine two months ago. Its main adversary has always been Russia, although it also has little patience for Western influence on Ukraine. “For all the years of Ukraine’s independence, Russia has pursued a systematic, targeted policy of subjugation toward Ukraine,” Yarosh says. “So of course we will prepare for a conflict with them,” he adds, especially after Russia’s recent invasion of another one of its former satellites, Georgia. So far, his jabs at the leaders of the opposition in Ukraine have not been quite as pointed. He has accused them of vanity and ineffectiveness, but he has also observed the truce they called a week and a half ago to allow their negotiations to proceed. “Not a single Molotov cocktail has gone flying since then,” he says proudly. But as Yarosh realizes, he and his men have staked a great deal on the outcome of these talks. If the ruling government holds on to power, Pravy Sektor could be forced to take the blame for the violence that left dozens of police officers in the hospital two weeks ago. “All those criminal charges are already waiting in the prosecutor’s office,” he says. On the other hand, if the opposition forms a new government, they are not likely to carve out a place for Yarosh and his men in the halls of power. So it is no surprise that he has begun to show some political initiative. For the past two decades, he has been waiting and preparing for the start of the “national revolution,” and now that he finds himself at the head of its armed division, he does not seem ready to let it pass peacefully away, at least not on anyone else’s terms. ‘Guys, don’t let us down. Take us to victory, to independence, if the other leaders are incapable of that,’” Yarosh says.